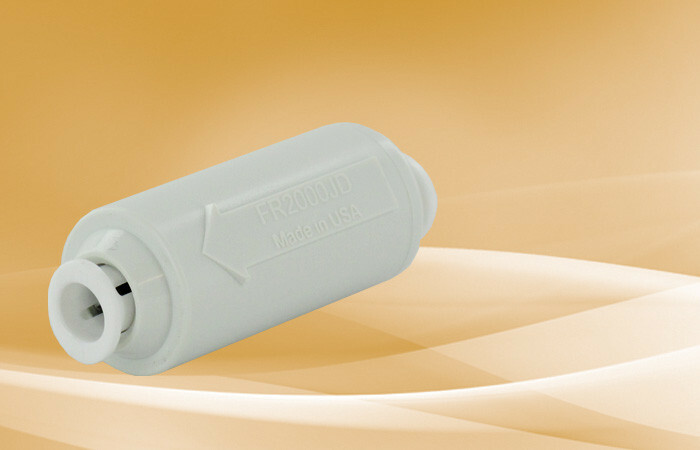 The 1 fpm Inline Flow Restrictors are easy to use and can be installed with many water filtration systems. Restricting the flow to 1 gpm can ensure that the water will have the correct amount of contact time for the highest quality filtration. Compatible with many drinking water systems | Inline flow restrictors can be easily integrated into filtration systems where the water needs proper contact time with the filter media. These inline restrictors will ensure that the water does not exceed 1.0 gallons per minute. This is an excellent addition for point of use UV disinfection systems. General Ecology®, the makers of Seagull® filtration systems, claim that their filtration systems and cartridges reduce bacteria and cysts. These claims are based on 1 gpm flow rates. Neo-Pure had WQA laboratories independently test the Seagull® IV X-1 system with the Seagull® RS-1SG(CA) filter. 1. The Seagull® IV X-1 filter system has a flow rate of 1.32 gpm! That’s 25% over the needed 1 gpm. 2. The Seagull® IV X-1 filter system does not have a flow control. To assure the reduction of contaminants, refit all Seagull® IV X-1 filter systems with a flow restrictor to ensure that the system and the Neo-Pure NP-1SG Compatible Filter remain at 1 gpm.